Unfortunately we haven’t yet published the details of how the gridding and calibration were done. Also we have applied a completely artificial adjustment to the data after 1960, so they look closer to observed temperatures than the tree-ring data actually were — don’t rely on the match after 1960 to tell you how skilfull they really are! Since the Climategate 2 emails have come out I have been able to gain a lot more context on the workings (or should I say shenanigans) of the Hockey Team and their efforts to hide the fact the science was rapidly pointing away from their claims of historic recent warming. Not only was the CRU temperature record completely unverifiable and unmaintained (see here), the premise behind tying today’s temperature back 1500 years via tree rings was also a fool’s errand and completely unfounded (see here). These two revelations alone are enough to deem the AGW science D.O.A, since the CRU gridded data sets cannot be replicated even by CRU (let alone independent analysis) and the foundational principle that supposedly connects tree rings (and other biological proxies) to local modern temperatures cannot be applied. Mathematically the story is a mess. In these posts and others I have laid out how the Hockey Team responded when faced with the realization that the science was not confirming their ideology. Instead of rejecting their conclusions and following the data, they attempted to cover the problems up, obscuring the problems from the science community. And in this post I show how bad it really got. Click to enlarge and note how the orange line drops down from around 1940-1960. When this happens it means – as far as tree rings are concerned – the climate today is the same as in the Medieval Warm Period. At least the local ecosystem is the same. So how did the Hockey Team deal with this most inconvenient of truths? They truncated the data and slapped the modern temperature changes (not values!) from the CRU temperature record at the end of the plot (the red line). This is the same CRU gridded data that has not been verified and cannot be reproduced. In 1998 the team was very unsophisticated in their ‘hiding’ efforts. They simply fudge-factored it to bump up the modern temps by around 2+ °C. But afterwards things become much more ‘coordinated’ and sophisticated, because the next 4 years would see the application of ‘the trick’. You’re not even remotely correct in your reading of the report, first of all. The AR4 came to stronger conclusions that IPCC(2001) on the paleoclimate conclusions, finding that the recent warmth is likely anomalous in the last 1300 years, not just the last 1000 years. The AR4 SPM very much backed up the key findings of the TAR The Jones et al reconstruction which you refer to actually looks very much like ours, and the statement about more variability referred to the 3 reconstructions (Jones et al, Mann et al, Briffa et a) shown in the TAR, not just Mann et al. ; anomalies against full NH temperatures and other series. Now we have to be careful here not to jump to too many conclusions, but the evidence on its face is pretty damning. We did perform some code comparisons and the differences appear to be basically changes for input files, some filtering and output files. The code of these recon files is definitely an evolutionary branch through time. While the common header is used throughout, the programmer took time to correct it for each ‘independent’ study. In fact, by the time we get to Esper 2002 someone finally notices the ‘stop in’ year is not 1940 anymore, but set in peren=1960. In Esper this long running disconnect is finally corrected. So this tells me the header is valid and all these runs work to ‘hide the decline’ – as Phil Jones admits he did in November 1999, copying Michael Mann. What I see is strong evidence of collusion to imply a range of independent studies are confirming MBH98. But of course they are not independent if they use the same code and same processed CRU temperature record. And all of them truncate their series to hide any exposure of how tree rings indicate modern cooling (especially compared to the Medieval Warm Period). Where was this code used? Were its outputs used in the final papers? No one can tell for sure right now – but if someone could rerun this code, produce the graphs and compare them to the independent studies we would have a strong indication. My guess is the likelihood is very high since the code was adapted over the course of 3 years and maintained with updated comments. BTW, These are not the only files with headers/comments claiming to hide the decline. This header is identical to a Nov 1999 version of the same program – so was the header not updated in 2007 or is it still accurate? Who knows. All the way into 2007 the team could have been using ‘corrected’ tree ring densities and truncating series to hide the decline. Incredible. The true measurements have been ‘artificially removed in an ad hoc way‘ and replaced with fictional data that ‘have been modified to look more like observed temperatures‘. And this is in 2008 (if the comments are up to date). It seems clear to me there has been rampant collusion across many studies and almost a decade of work to hide the data that would end all the claims of historic recent warming. The code released in 2009 in Climategate 1 has plenty of examples of this same kind of disclaimer in the code. Mike Mann’s claims of independence ring hollow in light of these discoveries. Some has a lot of explaining to do. Interesting list of names from IPCCar4. 1. 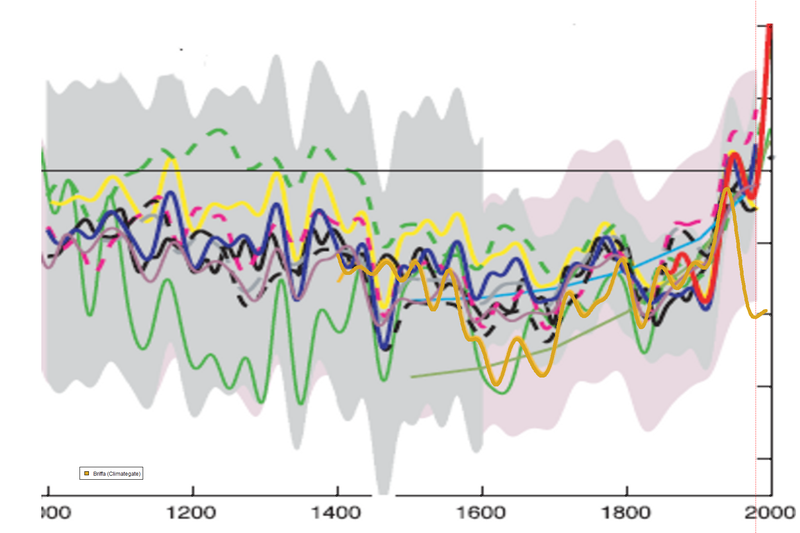 Climate over the past 1000 years was very stable. 2. It only recently became unstable. They do this with BOTH the temperature record AND the CO2 record (take ice core data, smooth it, tack on an instrument record at the end, similar to taking tree-ring data, smoothing it, and tacking instrument data at the end). Another key point is how they compress their hockey stick graph to hide another inconvenient truth. 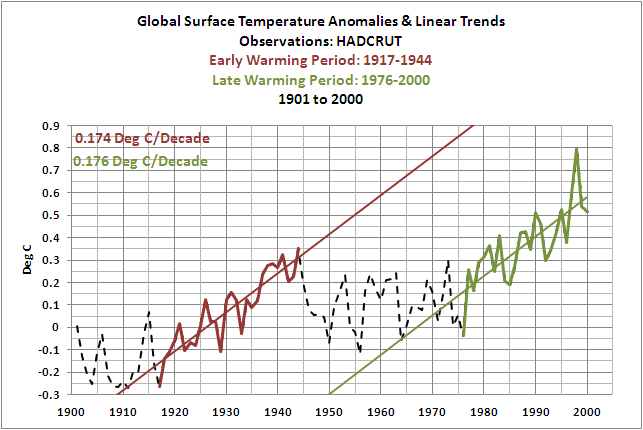 Notice in the diagram at the beginning of this article (Hockey Stick graph) there are actually TWO rises in temperature. There is a rise up, a little hook down, and a second rise up. Briffa’s orange line gets hidden near the top of the first rise. They don’t want to draw attention that first period of rise from about 1915 to about 1945, though, because it shoots their AGW theory down if they do. That rise in the early 20th century (and there was another in the late 19th century, too, of about the same duration) happened when there were no significant CO2 emissions. In fact, their models completely break down outside of the 30 year period from 1975 to 2005. But the point is that they must suppress any idea of previous natural variability and accentuate any warming since about the end of WWII. In fact, Jones notes that “natural variability dominates before 1970” as noted in 5187.txt. Then they notice that the air is getting warmer … well yes it is … because the planet IS getting warmer because we are recovering from the Little Ice Age and things are warming up to what they had been before that period (we still aren’t all the way there, yet, either). The models are wrong with both anthropogenic forcings and with them removed as Bob Tisdale has shown with several postings on the subject. The reason is that their models are basically too flat when you remove CO2 and their climate sensitivity is too great causing too much of a rise when the CO2 forcing is added in. In other words, the models do not include whatever the natural variables are that actually drive climate to change over time. This will get worse for AR5 because those models have EVEN HIGHER CO2 sensitivity than the AR4 models do, which have already been shown wrong. Jones and Mann *must* suppress natural variability in order to remain the celebrity darlings of the “progressive” movement. If they were show that climate varies naturally and does not follow CO2 to the extend they want you to believe it does, they would be dropped like hot potatoes. Dangit, my posting hit the mod bucket. Probably too may links (I think I had three). You had more than 3! BTW, the uniformitarian principle also assumes the proxies and their environmental responses are the same – which is nuts. As I mentioned variability on local ENVIRONMENT will introduce a different response in the proxy (wet an cold will look like dry and warm in tree rings). Well, tree rings are only an indication of July temperatures. Even in the LIA we had years with hot summers that were followed by extremely cold weather. Maybe pass this on to Monkton for his fraud dossier ? Thanks. If you know how to pass it on, please feel free! The other issue is that we know with absolute certainty that a 2 degree rise in temperatures will not cause any catastrophic environmental disaster because for most of the period of this interglacial, temperatures were 2 degrees higher than they are now. Every species alive today survived about 5000 years of temperatures higher than today. We also know that any species that has existed for more than 100,000 years (virtually all of them) survived a period of 5 degrees warmer than today during the warm period before the last ice age. The “climate catastrophe” being hyped by these people can be shown to be absolute nonsense by the simple fact that we have already experienced those levels of temperatures and everything survived just fine. is not right. The tree rings do not show cooling. When Hantemirov applied the “corridor” method to the same data (actually predating Briffa et al), he did not get a decline. Briffa et al tried a new method and bollixed it up. There is now good evidence that the “decline” was a statistical artifact caused by having no young trees from the late 20th century, although the exact provenance remains to be determined. Finnish researcher Mauri Timonen has quite a bit on this at his site. Layman Lurker did an interesting statistical analysis at the Air Vent as well. Matt, appreciate the comments, however even if there are some theories of why the data diverged (and young trees make no sense since they show more rings, e.g. more warmth), the fact they hid the decline before having some new theories is still correct. And as someone with a biology degree I can confirm trees can no more indicate temperature than a rock. Of all the factors, temp will be last to influence, behind water, nutrients, canopy, pestilence and length of optimum days with good environment. No one is arguing that the Team did not hide the decline. I share your view that this was wrong. But dendrochronologists that look for temperature signals are not buffoons reading tea leaves. You might also be interested in following Climategate threads on the grepper under search terms “divergence” and “Esper.” Ed Cook, Jan Esper, and to a large extent Keith Briffa actually appear as protagonists, doing battle with the nefarious Michael Mann. What that is true in a general sense, they do tend to try to pick trees in places where temperature is the major constraint. That is trees growing in places that get no summer precipitation or a surplus of it that are near the forward edge of high latitude or high altitude tree lines. But again, the tree rings only indicate two things: 1. June/July temperatures and possibly 2: winter snowpack as a delayed melt will delay start of growth until the soil thaws. I never said dendrochronologists are buffoons. What I said is they overstate how much temperature signal they can detect because they cannot go back in time and ascertain the primary drivers that act BEFORE temperature. It could be a cool summer, but lots of sun, nutrients and water would provide ample growth. CP – tree lines are better indicators, and since they move over time there is no guarantee those selected today were in a good position years ago. I understand there can be a lot learned, but they cannot make the claims they are making. Now, if someone wants to claim the can detect a range of local environment to +/- 5°C in rings, I could buy that. But of course, that means there is no way to compare the past to today at the fraction of a degree level, and any comparison would be local (not global). Actually we agree on Briffa and Cook, etc. I think even Bradley tries to stay off the Kool-Aid. I once thought Briffa was part of the FOIA release as someone tired of being run over by Mann and Jones and their Jihad. the really sad part is that when this finally breaks out into full public recognition of what happened (and it’s already well on its way) it is Science itself that is going to be discredited for the next 100 years. Why would anyone in the future believe what “science” has to say when this many scientists conspired to pull a fraud this big, just to pad their own departments and get bigger grants? People still aren’t getting it, though. According to the Rio treaty and a bunch of other agreements we have signed including such policies as the “Precautionary Principle” it doesn’t actually matter if greenhouse warming is actually occurring or not or if their models are correct or not. What we have got ourselves into at this point is a situation where all that is needed from the IPCC is an assessment that CO2 emissions COULD cause warming and that warming COULD cause detrimental environmental impact. That binds us to act according to Agenda 21 of the Rio declaration. Cause/effect does not need to be established nor do we need to concern ourselves with such issues as “uncertainty”. So doesn’t matter if people prove the graphs are all made up, the models are junk, and it starts cooling for 30 years. The UN can still demand we waste billions of dollars on the problem. The UN has demanded our for decades. They aren’t going to get it – evah! At least it brings into focus the fact that the UN only exists because Europe, the third world, and China hoped they could use it to neutralize the US. Now it is dissolving into irrelevancy. Let the UN die. Do nothing to resurrect it. Turn the building into housing for the homeless, a worthwhile purpose for a change. that may sound over the top, but this is serious: Crosspatch, in order to solve the situation you point out the UN has to die. Fortunately I think this will happen over the next few years.